Three times may be a charm in some realms, but it took four tremendous whacks to lift a certain rock off the Moon and shoot it serendipitously to Earth, scientists reported Thursday. 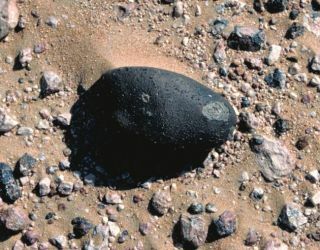 The smooth black rock, about the size of a fist, was found protruding from the parched surface of a desert in Oman in 2002 by Edwin Gnos of Bern University in Switzerland and two other geologists. Its unique composition allowed the researchers to pinpoint where on the Moon it came from and what it endured before being jettisoned to our planet. The rock left the Moon no more than 340,000 years ago, carved out of the Imbrium Basin -- the right eye of the "Man in the Moon" -- by an asteroid impact. Lured by gravity, the fist-sized object arrived on Earth sometime within the past 9,700 years. Gnos even thinks he might know the exact crater on the Moon from whence the rock came. The study, detailed in the July 30 issue of the journal Science, represents one of the most detailed accounts of the history of any meteorite. Any space rock found on Earth is called a meteorite. Most come from asteroids. A few have traveled here from Mars. About 30 Moon rocks have been found on Earth since 1979. Scientists figure roughly 20 lunar impacts have been responsible for sending those precious stores of information our way. But until now none had been identified with specific locations on the Moon. Other Moon rocks brought back by the Apollo astronauts have helped in understanding the lunar meteorites found on Earth. But none of the Moon rocks share chemistry with Sayh al Uhaymir 169, the one found in Oman. And that was a key to learning its origin. "The rock's chemistry is so unique, that only the area around the Imbrium impact basin was possible," Gnos told SPACE.com. In the meteorite, four lunar impact events are recorded stretching back to shortly after the Moon's birth. Each created tremendous heat that locked in chemical signatures that can be dated by various commonly accepted techniques, including how elements have been affected by cosmic rays over time. It was a stroke of luck that all four events left signatures in a single small chunk of the Moon. A colossal asteroid impact about 3.9 billion years ago formed the 720-mile-wide (1,160 kilometer) Imbrium Basin. Crushed and molten rock solidified to form the main material in Sayh al Uhaymir 169. The rock was reformed 2.8 billion years ago in an impact that carved the Lalande crater, creating a blanket of ejected material. A third impact about 200 million years ago in the crater ejecta blanket around Lalande brings rock to the surface that will later head toward Earth. High concentrations of thorium and other rare elements reveal the meteorite came from an area around Lalande known to contain similar elements, based on data collected by the Clementine and Lunar Prospector missions. An impact less than 9,700 years ago kicked the rock toward Earth. Regardless, the meteorite could hold important clues to the bombardment of the early solar system. The Moon retains a decent record of that bombardment in its many visible craters. And unlike at lot of rock on Earth that has been unrecognizably recycled by volcanic activity over the eons, a lot of lunar material retains records of some of the first impacts. Earth was presumably pummeled in the solar system's youth, too, but only by studying the nearby Moon can scientists grasp what went on. Imbrium basin rocks transported by Apollo astronauts are all dated to 3.9 billion years ago, give or take a few tens of millions of years, Korotev explained. Researchers have wondered if there was just one major impact at the time that created the vast basin, or if perhaps there were several catastrophes over the tens of millions of years. The age that Gnos and colleagues report is somewhat greater than that of Apollo rocks that have been identified as Imbrium material, Korotev said, "and that's exciting."